When a Sharon homeowner wanted to meet about redesigning her front yard gardens, Garden-911’s Carol Lundeen suggested expanding the vision to include improved circulation from the driveway to the front door, adding ease of use and curb appeal at the same time. View from the front door of a redesigned front entry in Sharon, MA. What was a once a bare concrete landing and stairs is now adorned under a portico, with slabs of elegant granite on the landing and treads. At ground level, where you see a path of white river stones was once an asphalt walk from the driveway to the base of the stairs. The planted area was once lawn, and there was no brick path lined with cobblestones. All these design changes improved the circulation around the home, as well as the curb appeal. Plantings include a MA native redbud tree, Cercis canadensis, and a ground cover of variegated solomans seal. 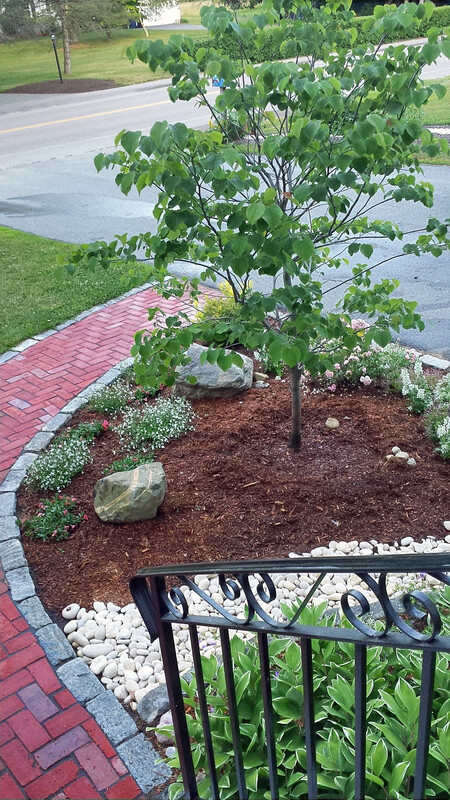 This entry was posted in Design, Landscape, Landscape Trees, MA, Native Plants, Sharon MA and tagged cercis canadenses, design, garden, landscape, MA, makeover, Native plants, redbud, Sharon, variegated solomans seal on July 17, 2018 by admin.